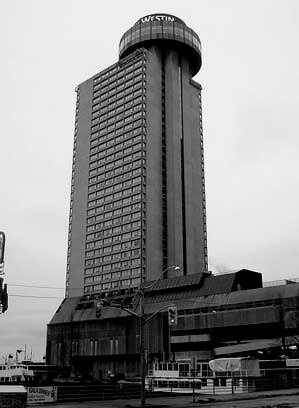 The Westin Harbour Castle Hotel is located on 1 Harbour Square, next to the waterfront in Toronto. It is fairly young as buildings go having been constructed in 1975, and most recently renovated in 2007. Internationally it is most famously known as the hotel where Keith Richards was busted in 1977. "I was at the Westin Harbor Castle on a business trip and went back to my room to rest between sessions. I had the TV on and was laying in bed with my eyes closed. I heard something move that wasn't a noise made by the TV, but I just thought that it was my roommate and didn't open my eyes. I heard a noise again over by the hotel desk and was thinking that my roommate was just being noisy, then I relized that my roommate had checked out so I opened my eyes to see where that noise was coming from if not the TV. I could clearly see a young woman with brown hair sitting in the chair at the desk in the room to the right of the TV. She was leaning her head against her right hand with her left arm down to her side and I could clearly see that her hair was tucked behind her left ear. It was weird, I saw her sitting there, and it didn't startle me at all. I closed my eyes again and she was still there, but this time she was staring at me, looking me directly in the eyes. Still it didn't scare me but I then closed my eyes sat up and rubbed my eyes for a second and re-opened them and she was no longer there. Very weird feeling, I have had some instances in the past but this one was during the day, when it was sunny out and I was wide awake. Didn't think anything about it until one of my coworkers mentioned she has experienced something too.